Out-of-Plumb Ratio – Maximum horizontal distance (inches or millimeters) from the centerline of the column at the floor to a plumb line that extends downward from the centerline of the column at the top shelf elevation divided by the vertical distance (feet or meters) from the floor to the top shelf elevation. Out-of-Straight Ratio – Maximum horizontal distance (inches or millimeters) from the centerline at any point on the column to a plumb line from any other point on the column divided by the vertical distance (feet or meters) between the two points. The higher the ratio, the more likely a rack is to fail. 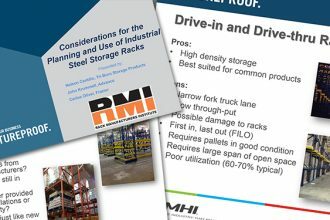 Recognizing this, MHI’s ANSI MH16.1-2012: Specification for the Design, Testing and Utilization of Industrial Steel Storage Racks section 1.4.11 limits the ratio for both out-of-plumb (leaning) and out-of-straight (bowing) loaded rack columns to 1/240. This equates to 0.05-inch per 1 foot of height (1.25 millimeters per 0.3-meter), or 0.5-inch per 10 feet (12.5 millimeters per 3 meters) of height. The limits are intended prevent excessive bows or dogleg conditions that may exist in a rack column. For example, a column could be plumb from top to bottom, but have an excessive bow (out-of-straight) in the middle. Alternately, a 20-foot-tall column that could be out-of-plumb 1-inch from top to bottom, which would be acceptable unless the entire out-of-plumb condition is solely between the floor and the 5-foot level, referred to as a dogleg (commonly caused by a fork truck impact). Other causes of out-of-plumb and out-of-straight conditions include beam height adjustments or alterations, the type of connection used, bolts that weren’t sufficiently tightened during the installation, or impacts with machinery or pallets as loads are moved to and from the racking. The best practice to ensure a safe installation is to inspect the racking regularly with tools such as a plumb bob, long level or laser line to determine if columns are leaning or bowed. Remediation of the condition includes first unloading the rack, then loosen the column bolts in order to straighten them, then re-tighten bolts. Beam connectors should also be inspected to ensure that the lean has not caused them to bend or otherwise deform. Want to learn more about how to determine if your racking is straight and plumb? 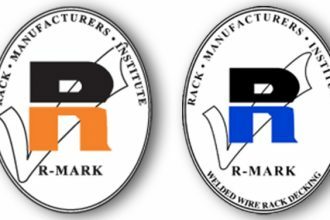 Download the RMI/ANSI MH16.1-2012: Specification.